A piece of hardware was intentionally tossed off the International Space Station June 19, 2014, during a Russian spacewalk. Two Russian cosmonauts are safely back inside the International Space Station today (June 19) after spending more than 7 hours outside for maintenance and equipment upgrades on the orbiting laboratory. 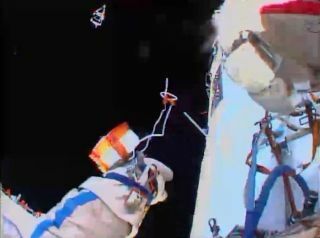 After donning their bulky white spacesuits, flight engineers Alexander Skvortsov and Oleg Artemyev opened the hatch on the Pirs docking port at 10:10 a.m. (1410 GMT) and floated outside a few minutes later. Oleg Artemyev was the first to leave the station for a spacewalk on June 19, 2014. The day's work included installing new communications equipment, repositioning experiments, inspecting latches, gathering swab samples from windows and jettisoning old equipment. The cosmonauts spent much of the first part of their spacewalk tackling the most complicated task — mounting a new communications antenna on Russia's Zvezda service module. The crewmembers took brief periods of rest when they started breathing too heavily. Though working without gravity may look effortless, spacewalking is tough labor. In his book, "An Astronaut's Guide to Life on Earth" (Little, Brown and Co., 2013), retired Canadian astronaut Chris Hadfield compared spacewalking to "rock climbing, weightlifting, repairing a small engine and performing an intricate pas de deux — simultaneously, while encased in a bulky suit that's scraping your knuckles, fingertips and collarbone raw." That difficulty was apparent near the end of the spacewalk when the cosmonauts became frustrated as they struggled to remove stubborn bolts from a piece of hardware that they were supposed to toss off into space. "You don't expect the little things to be so inconvenient," one of the cosmonauts said. "It is quite upsetting." The pair finally freed the equipment and jettisoned it away from the station. The truss-like hardware had been holding the MPAC and SEED experiments, which test how various materials handle exposure to the space environment. During the spacewalk, the cosmonauts moved the experiments to a new payload beam. The spacewalk, originally scheduled to last 6 1/2 hours, ended up taking 7 hours and 23 minutes. Skvortsov and Artemyev have been living and working on the space station since March 27, when they arrived for a 5.5-month mission inside a Russian Soyuz capsule accompanied by NASA astronaut Steve Swanson. They are joined by three other crewmembers on the station: NASA astronaut Reid Wiseman, European Space Agency astronaut Alexander Gerst of Germany and cosmonaut Maxim Suraev. Those spaceflyers launched to the outpost in late May. The six men make up the Expedition 40 crew. Today's spacewalk was the 180th in support of the station's assembly and maintenance. The $100 billion orbiting lab has continuously housed rotating crews of astronauts since 2000. Traveling at a speed of 17,500 miles (28,000 kilometers) per hour, the space station orbits Earth about once every 90 minutes.